Create unlimited Sci-fi vehicle sounds. complex dynamic engine sounds such as Podracers, Transformers, Tron, Blade Runner. - Create complex Sci-fi vehicle sound with a single knob. - Auto link modulation to generate dynamic accel/decel behaviors. - From pure oscillator sounds to aggressive machine sounds. - Rich factory preset collections for instant creation. 1 - Speed is the main control for creating acceleration and deceleration effects. It functions as a global control to the other modules. 2 - Oscillator module uses three oscillators to generate complex harmonic sounds. 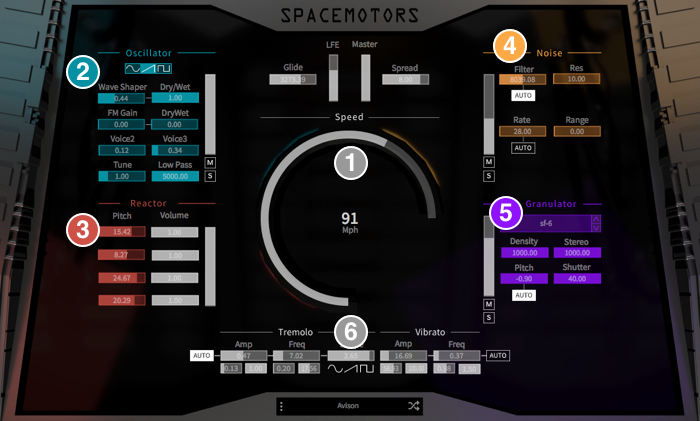 3 - Reactor module uses delay-based effects to pitch-shift the harmonic sounds generated by Oscillator. 4. Noise module adds a filtered noise layer. It provides an excellent variety for spacy hiss sounds. 5. 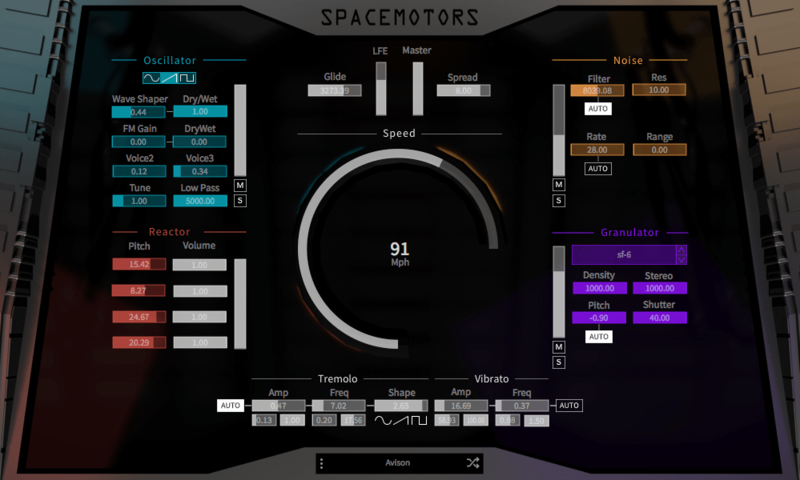 Granulator module generates the “core character” of the Spacemotor sounds beyond subtractive synthesis, allowing to create a wide variety of vehicle sounds. 6. Tremolo & Vibrato Effects apply complex modulation behaviors.